I waded through many suggestions, and tried to keep everyone’s suggestions a part of this creation process. For those who don’t already know, I am Bridgett, an author and deck creator. I am in love with History, especially that of Tudor England. Henry VIII was very much a Renaissance man. He filled his courts with those he liked best, and tons of pretty women who no doubt captured his attentions! After all, he did share bits and pieces of his heart with six wives. Not all at once though. ha ha. My bookshelves are adorned with many many books about him and his wives. I have a book that will be published this summer called, “Lethal Devotion,” that is also based on one of his wives and a daughter. Even though my story doesn’t take place during that period in time, the characters will take you back to that time period through their vivid memories. I am a creative, artsy type person who spends many hours expressing myself. Whether it is on paper, or the computer, or through words – I feel at my best when I can share my ideas with others. Since I have read Tarot for a bit over 15 years, I have started learning Lenormand cards. To my surprise I picked up on them quickly, and find them a bit more tender and cutsie than that of Tarot. I am in the process of making a Tarot deck, but since there are 78 cards it will take a great deal of time to finish them. 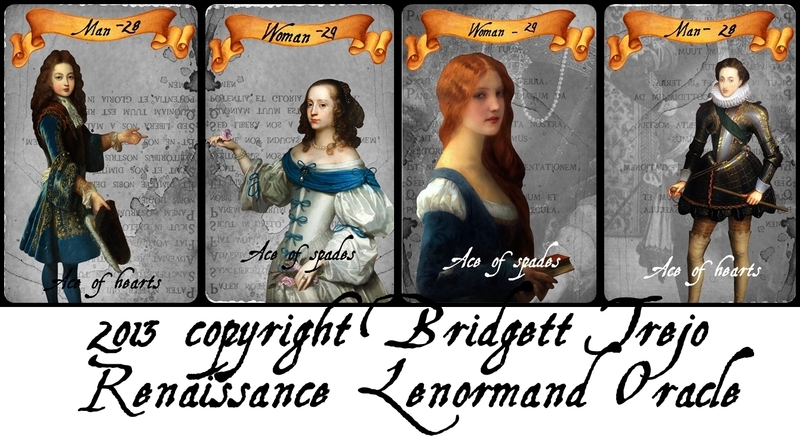 In between bouts with my Tarot deck, I have decided to create a Lenormand deck that shares my passion for The Renaissance Era. I have included an extra man, woman and child in this deck. I have paid close attention to the directions things face and kept in mind all the suggestions given me during the creation process. I have poured my heart into these cards, and now I offer them to you! I am taking pre-orders for them now. If you would like one – numbered and signed by me – please email me for an invoice. Invoices are made with paypal – and that is how you can buy your deck. If you live in the USA the cost is 25.00 USD. If you live over seas, most places are 30.00 USD, but please make sure you ask, because some places are more expensive to ship to. You are also required to pay any taxes upon arrival of your cards to your country.